Preheat oven to 425°F. In a large bowl, whisk together the muffin mix (setting the streusel packet aside for later), milk, melted coconut oil or butter, and eggs until smooth. Spray the top of a muffin tin with nonstick baking spray. Then, spoon batter into 12 muffin tins lined with cupcake wrappers. Scoop 2 tablespoons of cherry pie filling on top of the batter in each cupcake wrapper. For best results, use more cherries and less of the sauce. Sprinkle streusel topping over each cupcake. Bake in preheated oven for 15-20 minutes, or just until the edges of the cupcakes are golden brown and the centers are set. Cool before removing from muffin tins and serving. So ya like Cinnamon Toast Crunch cereal, huh? Then you'll love these cupcakes that start with new Cinnamon Toast Crunch muffin mix! Cinnamon Toast Crunch just got a new calling from on high. It’s now a muffin mix, too! And with it, you can make easy and impressive sweet treats, like these Cheery Cherry Cobbler Cupcakes! Grab a box of the NEW (and crazy delicious!) Cinnamon Toast Crunch muffin mix. This stuff is the start to some seriously delish snackage. Mix the muffin mix into a batter. Nab yourself a muffin tin, pop it full of some cute cupcake wrappers, and spray the top with baking spray (just to keep the removal process super clean and easy). Then, get all funky wiht it and spoon some cherries on top. Cherry pie filling (mostly cherries, leave the gooey filling in the can as much as possible) spooned over the batter turns these gorgeously good little muffins into ruddy, studdy, super blingalicious cuppies. 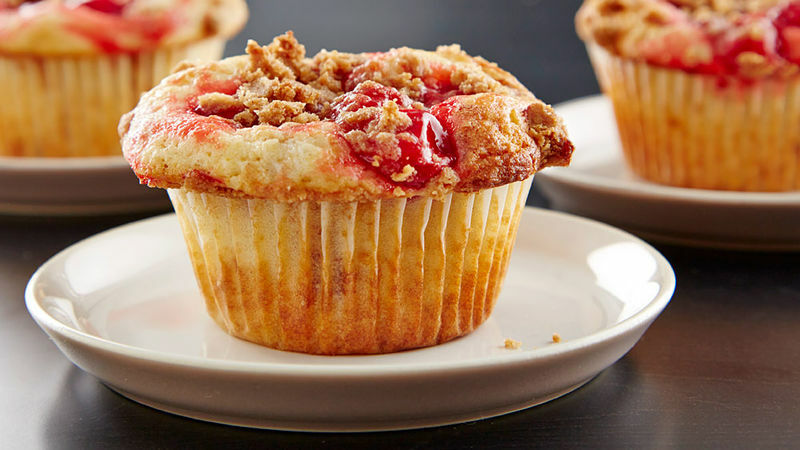 Streusel it all up, baby. The packet that comes in your muffin mix is about as easy as can be. No mixing needed! Just sprinkle and you're ready to bake! And bake you shall! Pop those cupcakes into the oven. Bake for 15-18 minutes. Remove, cool, then open up wide, schweetheart because this is one delicious dessert that may beg you to stuff, shmoop, and lick your fingers clean. What is schmooping? Well, you're just gonna have to make these cuppies and find out, won’t ya? !